Note: A $1.3 million yearling purchase, he was 2nd in the Norfolk Stakes, won an allowance, then finished 4th in the Hollywood Futurity last year. 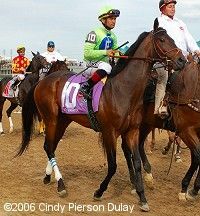 He was 4th in the El Camino Real Derby in his first start this year, but really improved to win the San Felipe. Chased Brother Derek all the way in the Santa Anita Derby but couldn't hold on to second at the end and was passed by Point Determined. Never ran a lick and finished 18th in the Kentucky Derby.